Why do some of your friends or family members seem to eat virtually anything and not gain weight? Why do others eat more healthfully and struggle with unwanted weight gain? This paper from Microbiome Labs, reveals recent scientific discoveries to shed some new light on this matter! We typically credit being lean to an individual just being lucky to be born with a high metabolism. “The latest research has shown that the type of bacteria you have in your gut controls the amount of calories you extract from the food you eat, the types of food you crave and also what food is converted to in the digestive process. Let’s look at the Good News. This presents the opportunity to support the right bacteria in your gut for a better health — to increase insulin sensitivity, increase fat burn, prevent fat storage, reduce inflammation, reduce gas production and improve satiety. In essence, we can reprogram our metabolism by supporting the ratio of different strains of bacteria in the gut. Number One. This means both consuming foods that are high in fiber AND eating few simple carbohydrates and sugars. But you have to do both — eat more fiber and only minimal amounts of simple carbohydrates and sugars to be effective. Why? This combination supports your gut bacteria to produce “fat busting compounds” known as short chain fatty acids (SCFA’s). Just eating a high fiber diet alone doesn’t achieve this. Neither does just keeping your simple carbohydrates low, such as on a Paleo diet. Number Two. The second important microbial technique is to get the right probiotics in your system, with meals. 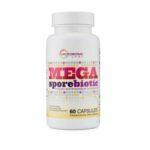 For example, MegasporeBiotic probiotics is formulated with a unique combination of probiotic bacteria that have been shown to convert fibers in the diet to the much desired SCFA’s which control the metabolic process. It’s complicated, but if you want more tips and detailed science, read the full Metabolic Reprogramming paper by Microbiome Labs. Any order of $49.99 or more qualifies for free shipping within the U.S.
Less than $49.99, shipping is $3.50. © Copyright The Nutrition Supplement Dietitian, PLLC. All Rights Reserved. *Statements about supplements made on this website have not been evaluated by the United States Food and Drug Administration and products are not intended to diagnose, cure, treat or prevent any disease. Janet Zarowitz, MS, RD, CDN, does not advise patients through the material contained on this Web site. This website is for informational purposes only and is not intended as a substitute for advice from your physician. You should consult with your physician before starting any diet, exercise or supplementation program, before taking any medication, or if you have or suspect you might have a health problem. *Brand and product trademarks are owned and controlled by their respective parent companies and used with permission.